New Delhi: ICAR signed the MoU with the Department of Biotechnology, Government of India for the collaborative R&D activities here today. The main aim of the event was to harness from the synergies of the two Departments and highlight the immense possibilities for the much needed emphasis on the multi-disciplinary R&D activities and nurture the innovations in particular areas of mutual interests. Dr. Trilochan Mohapatra, Secretary (DARE) & DG (ICAR) inked the MoU with Dr. Renu Swarup, Secretary, DBT. Both of them accentuated the importance and accomplishment of favorable results by the collaborations between both the organizations. 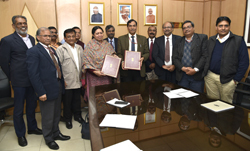 They emphasized that the MoU between both the organizations will lead to remarkable advancement of science and technology, engineering and application of engineering and technology in agriculture. Also the joint-venture will yield in catalyzing Scientist-to-Scientist contact and will help in transferring the technology to the agricultural fields that will be helpful in answering the various issues related to agriculture and engineering. Earlier, Dr. P.K. Agrawal, ADG (NASF) welcomed the dignitaries and other participants during the occasion. Dr. Anand Kumar Singh, Deputy Director General (Horticultural Science) and senior officials from ICAR and DBT attended the ceremony. For jointly planning and implementing the mutually agreed major national programs involving several stakeholders through joint funding and sharing of resources in the priority areas of agricultural biotechnology that includes crops, horticulture, veterinary science and fisheries. Transgenic crops, animals, fish and biological agents along with trait prioritization of traits. Strategies to employ the emerging areas of biotechnology tools, such as, genome editing, synthetic biology and nano-biotechnology in agriculture. Harmonize the laws governing bio-diversity, bio-safety, patents protection and food safety. Communication and public engagement in agricultural biotechnology. For establishing national platforms/centers for services related to genomics, genotyping, data banking, agriculture bio-informatics, GM food detection, validation of technologies, such as, vaccines, diagnostics of veterinary/fisheries use, molecular markers in crop and animal breeding. For formulating and introducing courses/training program in the area of IPR, bio-safety, bio-diversity conservation and germ plasm exchange, genomic selection and breeding for faculty and students through appropriate mechanisms. Research prioritization with other ministries and foreign collation like Indo-UK SIC, BRICS, African countries and “Look East” Program in relation to agricultural biotechnology. Previous article Punjabrao Deshmukh Krishi Vidyapeeth to launch Diploma in Agriculture Extension services with Dhanuka Agritech Ltd.